My most recent television appearance was devoted to encouraging viewers to come to my concert this coming Saturday. Alice Parker and I (known near and far—mostly near—as the Divas of Hawley, Massachusetts) will star in LOVE WALKED IN, an evening of classic love songs by such songwriters as the Gershwins, Cole Porter, Burt Bacharach, and Alice herself. 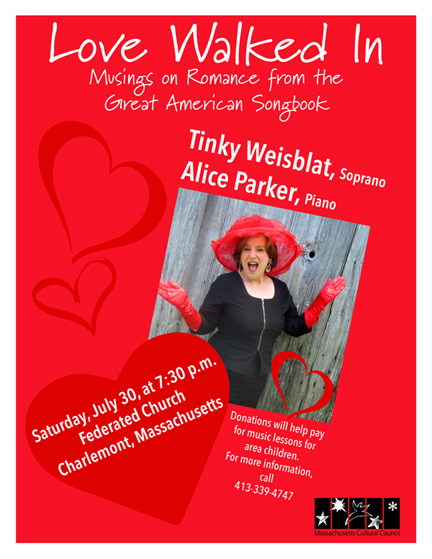 If you’re in Western Massachusetts this weekend, I urge you to join us on July 30 at 7:30 p.m. at the Federated Church on Route 2 in Charlemont. Donations at the door will go to the Rose Anna Dixwell Fund, which helps fund music lessons for local children. I firmly believe that all children—and all adults, for that matter!—should make music whenever possible so I’m proud to be associated with this endeavor. The evening will be fun, with lots of hamming it up from the resident soprano and lots of singing along. Cabot Cheese has donated nibbles for the after-concert reception, and bakers are standing by to brave the heat and make cookies, so our program should be delicious literally as well as figuratively. To highlight the concert’s romantic theme on Mass Appeal, I prepared my idea of a romantic meal. Everyone’s ideal romantic meal is different. This one was loosely based on a meal I enjoyed when I was 19 at la Maison de Van Gogh in Auvers-sur-Oise, France. 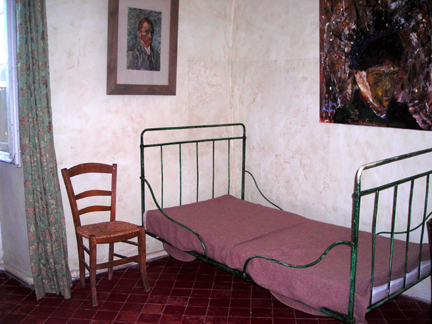 My companions and I toured the tiny room in which Van Gogh spent his last months. We then dined downstairs in a lovely, convenient restaurant. I ordered a small steak (really, the French know how to cook steak to perfection) with a delectable salad. To complete the meal the waiter brought an ENORMOUS bowl of chocolate mousse to our table. I was in food heaven. The company—my honorary godmother Dagny Johnson and her nephew Eric—was pretty wonderful, too. If Van Gogh had been able to enjoy such food and such company, he would probably never have committed suicide. I couldn’t replicate the steak or salad exactly; I’m not French. So instead for my romantic meal I made my favorite flank steak, which I have described before on this blog, and a fresh salad with my neighbor Gam’s herbed buttermilk dressing. Gam’s recipe calls for dried herbs, but since I had fresh ones I used those instead. The dressing turned a fascinating shade of green. 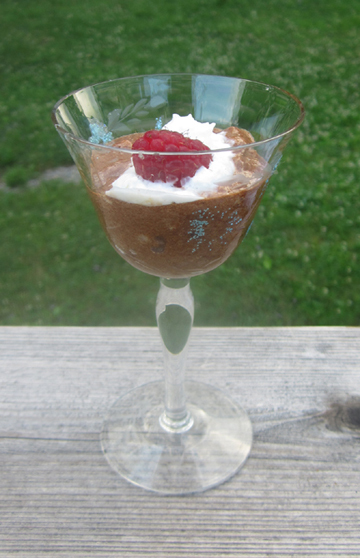 I did have a French recipe for chocolate mousse, thanks to my mother’s cordon-bleu studies. So the mousse was authentic. 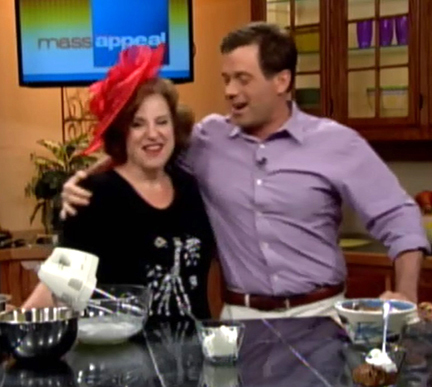 I didn’t have QUITE enough time to beat the egg whites for the mousse on the air—live TV presents unique challenges—but I brought along some mousse to serve and share with everyone at the studio. Seth comforted me following the egg-white debacle. Combine all ingredients in the order indicated and mix well. 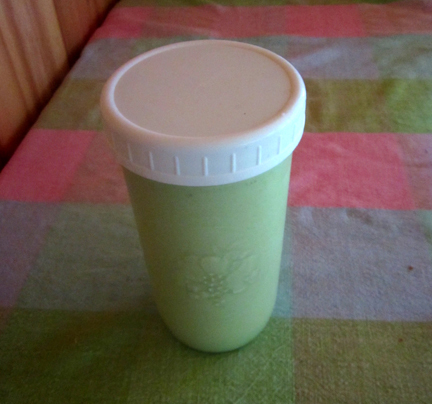 Store in the refrigerator, and re-shake before using. Makes a little over 2 cups of dressing. In the top of a double boiler (or in a heatproof bowl over warm water) combine the chocolate, the butter, the vanilla, and 2 tablespoons of coffee. Cook the mixture over hot water, stirring, until the chocolate melts. Remove the pan from the top of the hot water, and set it aside to cool. In another heatproof bowl combine the egg yolks, 3 tablespoons of coffee, and 1/4 cup of the sugar. Place them over the hot water and cook, whisking vigorously, until the mixture becomes uniformly frothy and lighter in color. Spoon the mousse into a serving bowl or bowls. Cover and refrigerate for several hours or overnight; then serve with a little whipped cream. Serves 8. I use condiments year round—but the summer grilling season in particular seems to cry out for them, particularly when I am the griller in charge. My grilling skills are definitely under par, and a little distraction can help. I have never mastered ketchup—and anyway it’s too early in the season to try making it (we are only just starting to find tomatoes in western Massachusetts). Mustard is another matter. I love it, and I make it often. As I have written here before, I love to give fancy, rich mustard as a holiday gift. At this time of year, however, I go for a simpler mustard. I made it last week on Mass Appeal and want to share the recipe with you. If you don’t like your mustard with kick, cut down on the dry mustard or add more honey. For me, the formula below is pretty perfect. Place the mustard seeds in a stainless-steel bowl. Briefly go at them with a pestle if you have one to release some of the oils. Add the mustard powder, and stir in the water. Let the mustard sit for 10 minutes. At the end of the 10 minutes pour in the vinegar. Cover the mixture and let it sit overnight. The next day, place the mixture in a blender. Add the salt and honey. 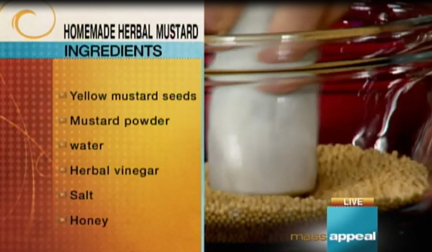 Pulse quickly to blend, but try to leave some bits of mustard coarse. 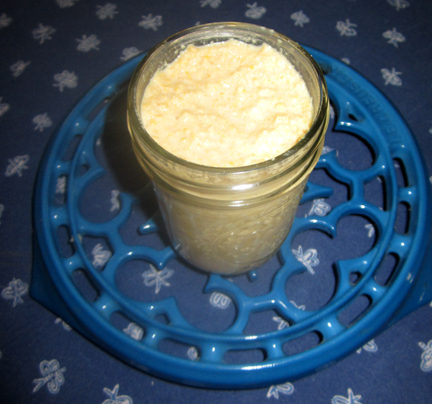 Pour the mustard into a clean glass jar, cover, and refrigerate for 1 week before using. Makes about 1-1/4 cups. Saying goodbye to strawberries can be hard. I DO have the consolation of raspberries, but still strawberries speak to me of high summer as no other fruit can. 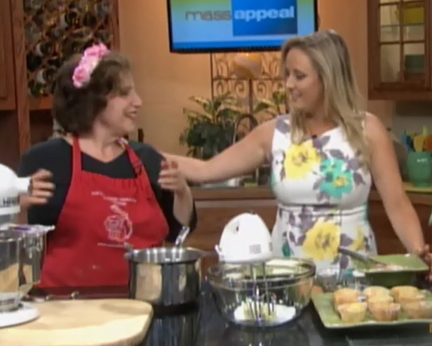 I felt I had to squeeze in one final strawberry dish on Mass Appeal last week. 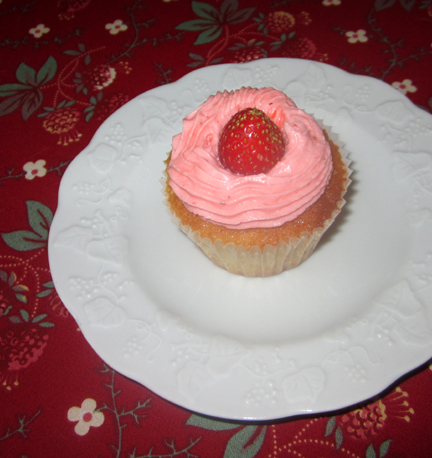 I chose cupcakes with strawberry icing because everyone likes a cupcake. I used my favorite yellow cake formula for the cupcakes. For the icing, I thought long and hard about the best way in which to incorporate my fresh berries. I was tempted by a technique I saw on the website of King Arthur Flour, with which one simply cuts up berries and beats them into the icing. I loved the result. So did Seth Stutman and his new co-host Lauren Zenzie. In fact, so did everyone at the studio. The cupcakes disappeared in no time at all. Lauren and I are getting along just fine. First make the cupcakes. Preheat the oven to 350 degrees. Line 18 cupcake/muffin pans with liners. In a large bowl, cream the butter until light and fluffy. Beat in the sugar and then the eggs, one at a time, beating well after each egg. Beat in the vanilla, the baking powder, and the salt. Stir in the flour and the milk, alternating between the two and beginning and ending with the flour. Pour the batter into the prepared cupcake pans. Bake until a toothpick inserted into the center of the cupcakes comes out clean, about 25 to 35 minutes. Cool the cupcake pans over racks for 10 minutes; then remove the cupcakes (with their liners!) from the pans. Cool. Pour the strawberry liquid into a saucepan, and cook it over medium-high heat until the liquid reduces into a thicker puree (about 10 minutes on my stove). Remove the puree from the heat, and allow it to cool. Ice the cupcakes. Try to eat them as quickly as possible (this won’t be hard!) as the strawberry icing is perishable. Makes about 18 cupcakes.